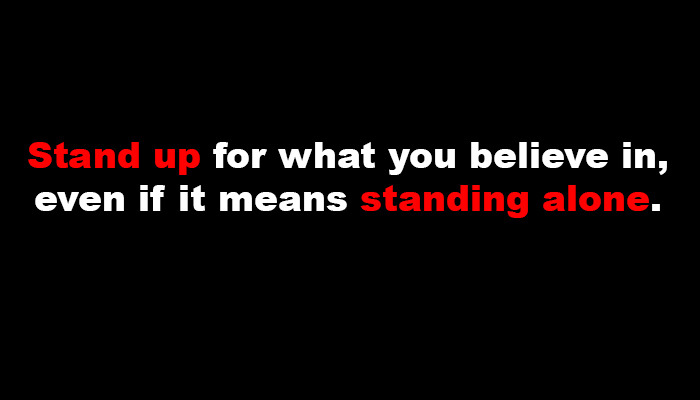 Share the post "Stand your Ground"
What I find more and more troubling in our country is how people in all age groups tend to take normal meetings to just get some problems solved and turning them into dark-sided circuses. I happened to be at a meeting several days ago and was internally shocked at the vulgar language as well as the scurrilous remarks that were totally uncalled for at such a meeting. Several times during that meeting, I calmly requested that they cease with the improper language. Believe it or not, some of them considered me some sort of tender eared sensitive who feigned whenever hearing such words. Actually I am far from that character. I endure what I must in my job and indeed have heard nearly every form and kind of back alley remarks. When I hear people who are in their 60’s, 70’s and even in upper 80’s using such language, I truly believe our country is on the wrong track. Who do we blame? Do we blame ourselves for allowing it to happen? Do we blame the media for creating hour long talk shows that sensationalize every form of dis-functional behavior? Or do we blame our society in general for creating the fear factor. Fear of being rejected, fear of being sued, fear of being without money and fear of loosing friendships are just of few of the fears that cause us to bow to this type of bullying behavior. Since I can remember, I have always been of the mindset that I wouldn’t do anything to anyone that I wouldn’t want done to myself. Yes, we all have our bad days and we say things sometimes that we don’t mean, but when it becomes a general rule of behavior, I find that unacceptable. Each year there seem to be more and more times that people challenge me in a bad way. When I stand my ground and reject such behavior, they seem to dislike me all the more. Shouldn’t be work on building each other up rather than tearing each other down? If you believe in your core that something is wrong when someone else is trying to convince you otherwise, just stand your ground and let the cards fall where they may. Perhaps we loose a few battles, but I don’t think we will loose the war.